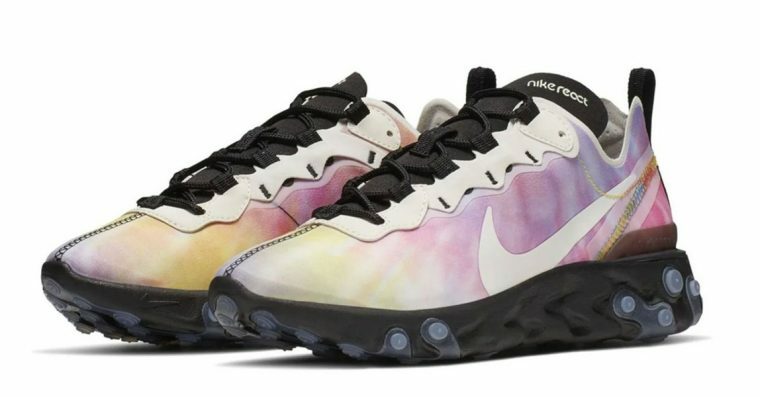 The Sole Womens > News > Upcoming Sneaker Releases > You Don’t Want To Miss These Tie Dye React Element 55s! 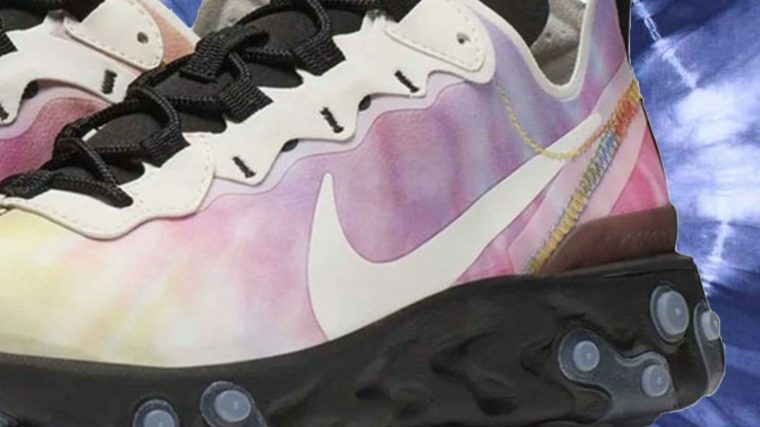 You Don’t Want To Miss These Tie Dye React Element 55s! Since it first dropped, the Nike React Element 55 has become a firm favourite among streetwear-loving Cozy Gals. They’e comfy, fashion forward, and a little more unique and funky than your standard Air Max silhouette. 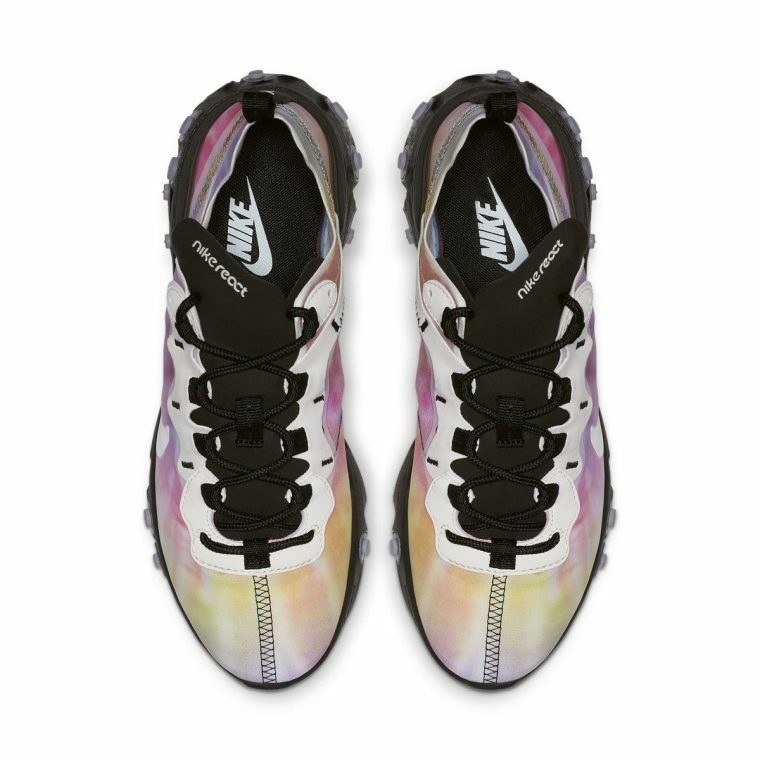 Nike is going all out with its upcoming Element 55 Release, by turning the usually colour-blocked upper into something much more nostalgic with a multicoloured deconstructed tie dye design upper. This upcoming release shows a tie dye colourway that combines pink, yellow, green, and red hues on the main base of the upper, with contrasting black accent colours. 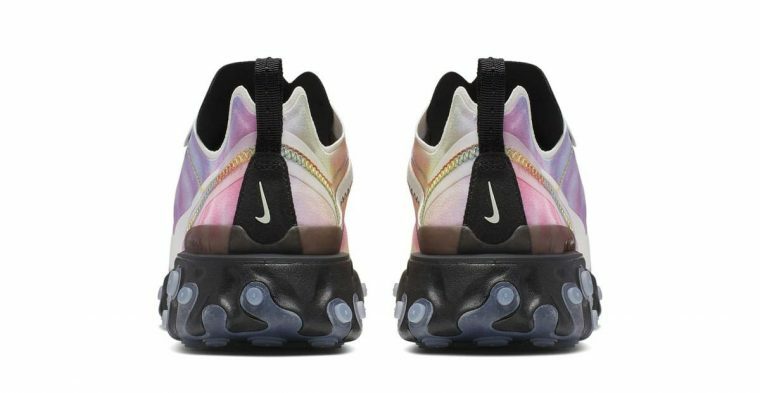 The black elements are on the lacing unit, the Nike React branded tongue, Swoosh branded heel counter and of course, the full length React cushioned midsole – which is also accented with translucent circular notches throughout. The tie dye style upper is giving us 60s and 90s retro nostalgia. This hippie vibe makes them *the* perfect trainer for festivals and summer raves – those events where you’re covered in glitter, have a flower crown on your head and a funky outfit to match. And because the React sole is so comfy, you’re going to last all day and all night in these! For those of you who may have missed out on some of the coveted Nike React Element 87 silhouettes with their translucent uppers, the 55 silhouette is definitely your next best bet, since they share a similar base design and those now iconic notches on the midsole – a midsole that *has* to be one of the comfiest yet! If you can’t wait for these to be released, why not get ahead with copping the Nike React Element 55 in Pink White. We don’t have a firm release date on these summer ready beauties yet – so make sure you stay tuned to The Sole Womens on site and our socials to be the first to know when they drop!